Are we electing a president or someone to play-act the part of president? During the 1988 presidential campaign Joan Didion observed “that the democracy we spoke of spreading throughout the world was now in our own country only an ideality.” This remains without question the case nearly 30 years later. 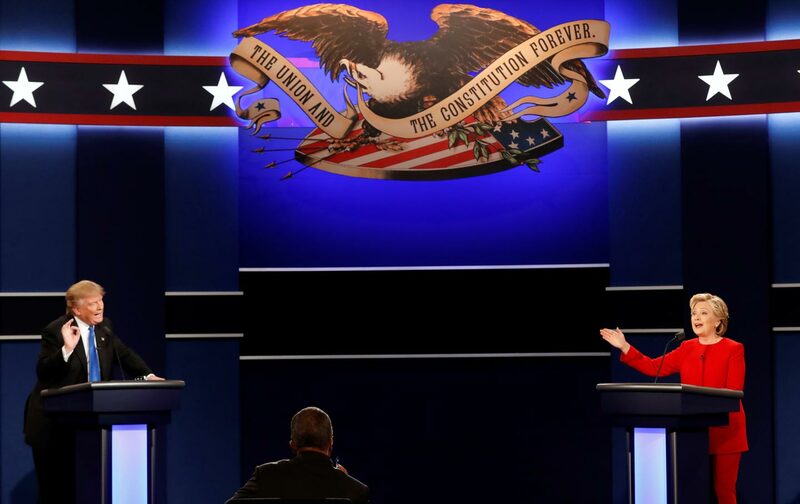 The embarrassing spectacle that was tonight’s “debate” between the two major-party candidates should, but likely will not, serve as a wake-up call to the people of the United States that our democracy is approaching an advanced state of degeneration. Not that you could tell by the televised commentary on offer in the run-up to Monday night’s debate which, in tone and substance, resembled one of those pre-game college-football shows broadcast live from some stadium parking lot in Columbus or Ann Arbor—complete with cheering, placard-0waving crowds in the background. In keeping with the carnival-like atmospherics, the commentators (at one point CNN’s Jake Tapper was flanked by no fewer than eight fellow talking heads) were giddy with anticipation for the big showdown. It was as though they were desperate to give off the impression that something good, perhaps even laudable was taking place in Hempstead, NY, determined to say anything to distract from what was actually going on. The cable news blather is self-perpetuating, and ultimately meaningless: Anderson, Wolf and Jake aren’t out to ruin the party, they’re out to secure their place in the pecking order. Professional self-preservation obliges the punditocracy to gloss over what is only too obvious: that this is a contest between two American oligarchs, an election on offer to highest bidder. Ask yourself how US political elites would react if, in any other country, there were an election between the wife of a former president who, along with her husband, brothers, daughter, and son-in-law, has shamelessly and relentlessly cashed in on her position of public trust, and a spray-tanned ignoramus who made his name as a casino magnate and reality-television star? The choices brought to us by the primary voters of the major parties should be cause for a deep period of reflection—if not abject shame. When similar sham elections take place—as in, say, Gabon or Uzbekistan—the State Department is quick to issue sententious statements to the effect that “your elections were fraudulent, do better, be more like us.” In the wreckage of the billion-dollar (and counting!) contest between Clinton and Trump will any sentient being ever take such scolding seriously again (in the unlikely even they ever had in the first place)? Now let’s consider the spectacle itself. Moments before the candidates arrived on stage, Jake Tapper solemnly intoned that Trump will need to prove that he can act “presidential” while David Axelrod suggested that both candidates should show some “self deprecating humor” in order to humanize themselves. Right off the bat, Clinton floated a lame line about Trump’s economic plan being “Trumped-up trickle down,” while Trump shouted, “You’ve been fighting ISIS your entire adult life”—which, even by Trumpian standards, was a touch off base. Personal attacks were the order of the night. Clinton hit Trump hard on his business, charitable, and tax records, while Trump, as expected, went after Clinton on the e-mail scandal. Clinton responded in kind, basically calling him a deadbeat, which, as anyone who knows even a little about the New York real estate world, is true. On foreign policy, Trump continued to repeat the lie that it was Obama and Clinton who were responsible for what he believes was the premature withdrawal of American troops from Iraq. Clinton continued in her quest to tie Trump to Vladimir Putin. Then Trump tied himself into knots over whether or not he supported the 2003 Iraq War, embarrassing himself (if, that is, he can feel embarrassment) in the process. In other words, what’s important isn’t what was said, but how. Which makes you wonder: are we electing a president or someone to play-act the part of president? Meanwhile the long, sad slide into oligarchy continues apace.